At Cosmedic Skin Clinic, we offer superficial peels to brighten, tighten and smoothe the skin as well as deeper medical grade peels which need to be performed by a doctor or nurse. Deeper peels can penetrate to the lower layers of the skin and exert a direct effect on the keratinocytes (skin cells). 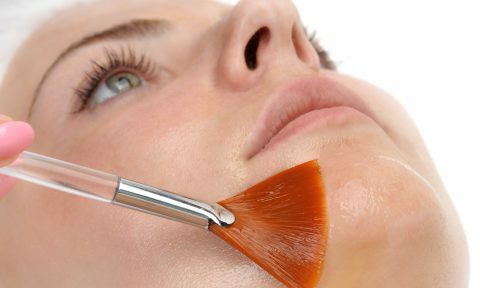 We offer a range of peels with a diverse combination of acids and other ingredients including glycolic acid, salicylic acid, tricholoracetic acid (TCA), lactic acid, citric acid, kojic acid, retinoic acid, glutathione, phenol and hydrogen peroxide. Some of our peels contain a single acid whereas others are a blend of ingredients, however, the choice will always be tailored to your individual requirements. This unique formula debuts a new era in skin health and as we simply put it “Perfection: The Future of Skin Rejuvenation”. Never before has a peel offered results at this level to all ranges of skin types. The Perfect Peel® founds itself on a key anti-ageing ingredient never before used in a peel: Glutathione. exposure, air pollutants and environmental stress. The face, neck, chest and hands are the most commonly treated areas. It can be applied to other areas of the body, but the process and the results will not necessarily be the same. The Perfect Peel® is a medium depth, blended medical grade peel which combines intense ingredients with effective acids to deliver outstanding results. Glutathione: The Perfect Peel® is the only peel that premieres glutathione as a founding component and is the only true anti-ageing ingredient offered exclusively in the formula. It is a potent anti-oxidant, preventing free radical damage caused by UV exposure, toxins and pollutants in the skin as well as having a beneficial effect on pigmentation. Tricloroacetic acid (TCA) (33%): TCA has been used in chemical peels for many years and stimulates the growth of new skin cells, has an anti-inflammatory action, helps to clean the pores, destroys bacteria associated with acne and increases the collagen and elasticity of the skin. TCA is used for smoothing the skin texture and reducing fine lines. Salicylic acid: Salicylic acid is a beta-hydroxy acid that is favoured for its keratolytic action, , exfoliating the dead outer layer of skin cells, as well as dissolving follicular impactions, anti-inflammatory exfoliation and reducing acne lesions. Kojic acid: This has been used in many products to deal with pigmentation problems for lightening and brightening. It is a potent suppressor of melanin production. Retinoic acid: A Vitamin A derivative and considered one of the most vital components of any skin care regime. Retinoic acid increases skin cell turnover and produces a more regular, structured and healthy skin layer. In addition to this, they help reduce abnormal pigmentation formation and increase collagen production. Phenol: Having antiseptic and anaesthetic properties, phenol helps penetration and acts as a delivery vehicle for the other constituents allowing a deeper peeling. 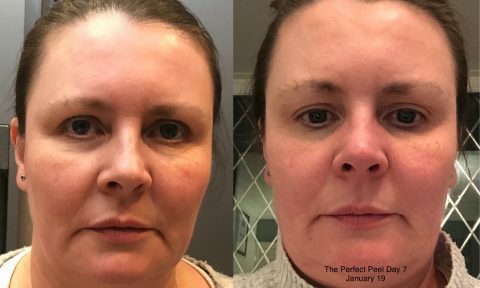 The Perfect Peel® is a medium depth chemical peel and it is likely to cause a stinging or tingling sensation as it is applied which will settle after a short time. Some numbness of the skin is noticed after the first pass of the peel. Although it has been used safely in all skin types, it is not suitable for skin that is irritated or after waxing, electrolysis, microdermabrasion, chemical exfoliants or ablative laser. It should not be applied to skin that is infected, sunburnt or have open wounds. Aftercare products are required following the treatment and these will be provided. Following treatment, the skin may feel tight and be reddened, like a mild sunburn, this is normal and will settle over a few days. Peeling tends to occur on Day 3 after the procedure and may just be a small amount in certain areas or more extensive. Rarely, there may be more than expected irritation, burning, itching or pain and the redness may persist for a longer period. Swelling can occur, particularly in sensitive areas such as under the eyes. Very rarely, there may be some blistering of the skin. Complications that can occur later include infection (including an outbreak of herpes or acne), delayed healing, scarring, textural changes and damage to the skin. Pigmentation issues (either too much or too little) may occur and it is essential to avoid sun exposure and use a broad spectrum sun protectant of at least SPF 30 after the procedure. If any complications arise or if there are any other concerns, it is essential to contact the clinic immediately. Immediately after the peel, the skin will appear either red or darker. Peeling generally begins on Day 3 and should be completed by Day 6-7. It is important to follow the aftercare advice that is given. 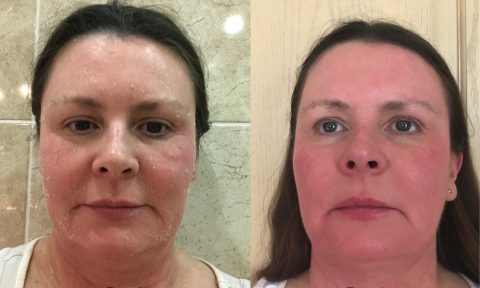 A further peel can be applied, if necessary, after healing is complete at 4 weeks and the results can be maintained by using an appropriate, prescribed skin care regime from your practitioner. It is recommend to repeat The Perfect Peel® every 3-4 months. The Perfect Peel® is a medical grade skin peel and should only be carried out by either a doctor, dentist or nurse. 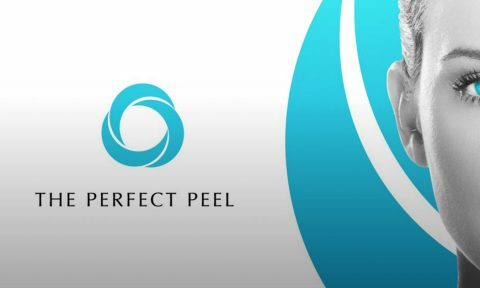 The Perfect Peel® uses a blend of chemicals to create a controlled wound to the skin which in turn initiates a process of peeling and healing. Irritation and discomfort are considered normal and can be present up to seven days post treatment. If discomfort is severe, please consult with your medical practitioner who performed the procedure. Although no pre-peel skin preparation is required for The Perfect Peel®, it is advised to avoid any exfoliating products (such as glycolic, lactic, salicylic acids) and retinol (Vitamin A) products on your skin for one week prior to treatment and until healing is complete. Similarly, avoid shaving or waxing the area for a few days prior to treatment. 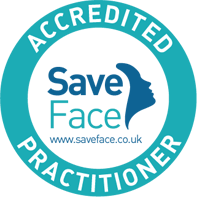 The procedure should not be performed alongside any other exfoliating treatments including other skin peels or microdermabrasion without the agreement of your treating practitioner. If you have previously suffered with cold-sores, you must disclose this to the practitioner prior to treatment as you may require medication to prevent an outbreak. A medical history form must be completed prior to any treatment. If you are feeling unwell on the day of treatment, please contact the clinic to re-arrange your appointment. Day 1 is the day The Perfect Peel® is applied in clinic by your practitioner. Immediately after the procedure, the treated area will feel tight and may appear darker. After application, the peel solution should remain on the treated area for at least 6 hours. During the first 6 hours, do not wash, touch, rub, or apply make-up to the treated area. Make-up should not be applied on the day of treatment. On evenings 1 and 2, gently wash the treated area with water only and pat dry and around 15 minutes before bedtime, vigorously apply a post-peel towelette (one on each evening) to the treated area and allow to dry. Be aware the towelettes are a very important part of the peeling process, they can mildly sting and irritate on application, this is normal. The towelettes are included in your home care kit. Some irritation and discomfort are considered normal. A cold compress can be applied to the irritated area to relieve symptoms if required or painkillers can be taken. If irritation or discomfort are extreme or there are any other concerns, please contact the clinic without delay. It is important not to use any moisturising products on the skin until the peeling begins which is usually around Day 3. Avoid sun exposure, excessive sweating, sauna or heavy exercise during the peeling process. Peeling generally begins on Day 3. Once peeling has commenced, apply The Perfect Peel Moisturiser (included in the home care kit) to the peeling areas to control the peeling and relieve the tightness. Do not rub, pick or pull on the peeling skin as this can lead to scarring, let the peeling occur naturally. Gently wash, but do not scrub, and pat dry the treated area morning and night, and apply The Perfect Peel Moisturiser as needed. A sunscreen of at least SPF 30 should be applied daily and every 2 hours in sun exposure. The peeling process is generally complete. Mild sloughing may still be occurring in some of the treated areas. 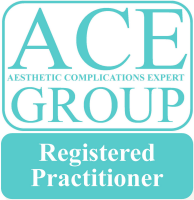 You may resume use of your normal skin care products unless otherwise advised by your treating practitioner. If the treated area becomes or remains irritated, wait until the sensitivity subsides. Continue to protect your skin with a sunscreen containing at least SPF 30. How does The Perfect Peel® compare to other peels? The Perfect Peel® combines intense ingredients with effective acids to deliver outstanding results after one treatment. 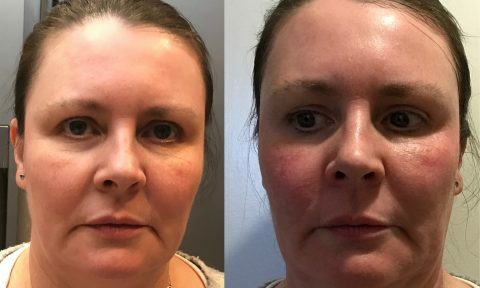 This unique formula allows for an increase in lifting of fine lines and wrinkles as well as a lightening of melasma, sun damage and hyperpigmentation. The Perfect Peel® is a non-invasive relatively pain free treatment that entails only 5-7 days of peeling. After one treatment of The Perfect Peel®, overall skin tone and complexion will appear smooth, glowing and fresh. Depending on skin conditions, multiple treatments may be necessary for desired results. A series of 2-3 treatments applied once every 4 weeks will allow for optimal results for more severe skin conditions such as melasma and active acne. As long as the skin is maintained with good quality skin care products such as The Perfect C cream the improved results will last. We recommend two to three treatments of The Perfect Peel® per year to sustain desired results for regular maintenance and rejuvenation. What skin types respond well to The Perfect Peel? All skin types (Fitzpatrick 1-6) are safe to treat and will reveal considerable improvements from The Perfect Peel®. What type of preconditioning is required? The Perfect Peel® requires no preconditioning of the skin prior to treatment. Only patients who use Roaccutane® must stop usage 3 months prior to treatment in order to achieve desired results. Does The Perfect Peel® burn? The patient may feel a slight stinging or tingling sensation which will subside after just a few seconds. Numbing takes place once the first pass of The Perfect Peel® solution is applied. A fan or cool breeze may be used for the comfort of the patient. The Perfect Peel® application only takes 15 minutes to administer. How severe is the peeling and what is the duration of the peeling process? The amount of peeling skin associated with The Perfect Peel® is mainly a sloughing of thin sheets of epidermis skin that begins around day three and generally is completed by day six or seven. What will I look like during The Perfect Peel® treatment process and post peel? Immediately after the peel has been applied the skin will either appear red, like a sunburn, or darker. On day three peeling will begin. The Perfect Peel® home care moisturiser (included with each peel) will reduce the visibility of peeling by hydrating. By day six or seven the peeling process should be complete and the results are visibly astonishing. Will my daily routine be affected after the treatment? Normal activities may be resumed immediately post peel. We only recommend avoiding heavy exercise and excessive sweating during the peeling process. Can makeup be worn post peel? The day the peel is applied the patient should not put any make up or other products on his or her face post peel. Make up may be worn on day 2 of the peeling process. The Perfect Peel® may be applied initially every four weeks if necessary until the desired results are achieved. Thereafter, we recommend once every 3-4 months to maintain improved skin results, as well as, prevent further ageing and environmental damage. Can The Perfect Peel® be applied to other parts of the body other than the face? The face, neck, chest and hands are the most commonly applied areas. The Perfect Peel® can be applied to other areas of the body, but the process and the results will not necessarily be the same. Will The Perfect Peel® help improve acne and acne scars? The Perfect Peel® formula was designed to help improve various problematic skin conditions. Acne is a major factor in what this treatment is tailored to resolve. The Perfect Peel® helps minimise the damage and scarring done by acne. The Glutathione helps increase cellular turnover to dramatically improve stubborn acne scars. A series of peels will be necessary to diminish the damage and scarring. How many treatments are necessary to resolve acne scars? Depending on the severity of the scarring, a series of 3-4 peels every four weeks will be needed for optimum results. The number of treatments will also depend on how vigorous the layers are applied. How will The Perfect Peel® improve my skin? The Perfect Peel® will help erase fine lines and wrinkles, reduce enlarged pores, help build collagen and elastin which will help to tighten and firm the skin. In addition, it will reduce or even eliminate hyperpigmentation and melasma. Acne and acne scars are dramatically improved. The treatment fights free radical damage to remove discoloration due to sun damage and even out overall skin tone and complexion. Will my skin be sensitive post peel? Is sun exposure permitted post peel? Sun exposure should be limited if not avoided before and during the peel process to avoid uneven exposure. When can the patient receive his or her next treatment of The Perfect Peel®? 3-4 weeks after recovery (once the entire peel process is complete). Is there an age requirement or restriction to use The Perfect Peel? 18 to 75 years old, those with any health conditions should check with their medical practitioner prior to treatment. 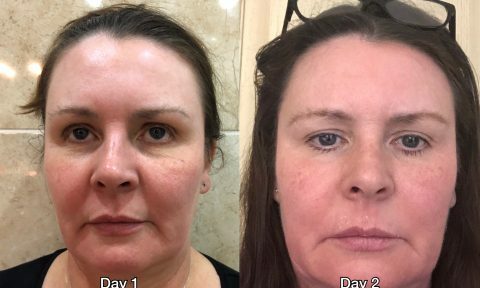 “Peeling only lasted a couple of days and I am over the moon with how my skin now looks and feels! Definitely worth it! !” Kelly, Walsall.